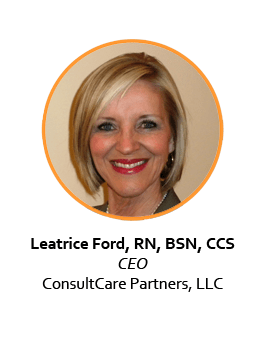 Ms Ford, RN, BSN, the founder of ConsultCare Partners, LLC is a registered nurse and Certified Coding Specialist (CCS) specializing in hospital compliance, coding and reimbursement. Her clinical experience includes cardiovascular, nephrology and orthopedics. As a consultant, she worked for four national healthcare consulting companies before creating her own. Her 30 years of healthcare experience in both clinical and consulting has enabled her to assist over 80 hospitals to identify and achieve cost savings and improved reimbursement. Her reimbursement experience includes assisting hospitals with compliant coding and billing. She is frequently interviewed by nationally distributed healthcare journals regarding hospital payment. Most recently she has contributed to healthcare related articles published by The New York Times and The Center for Public Integrity. She has authored and co-authored articles on coding and reimbursement issues. Her extensive knowledge of healthcare data analytics and Medicare reimbursement makes her an expert speaker on documentation, coding, reimbursement, revenue cycle and Medicare compliance. She is a graduate of Western Kentucky University and the University of Evansville. She is a member of American Health Information Management Association (AHIMA).